Here’s an interesting post today, or at least I hope you find it so. It’s about one of the more unusual plants that grow in Nova Scotia. You would think it’s a fungus, but it’s not. I just caught some specimens near the end of their growing season. That's why the beauty shot is from Flickr. The plant in question is called Monotropa uniflora. We locally call it Indian Pipe. It’s interesting because it produces absolutely no chlorophyll and therefore is completely white, or nearly so. As the plants age the "pipe bowls" straighten and face upward. This being a plant is unusual because chlorophyll is the pigment that is crucial for plants to photosynthesize light and grow. It uses a completely different system to generate energy. 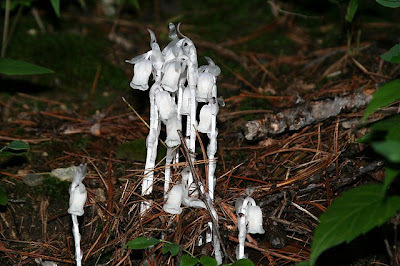 Indian Pipe, also known as Ghost Plant or Corpse Plant is a herbaceous perennial plant. It is native to temperate regions of Asia, North America and northern South America. It is fairly rare in occurrence. 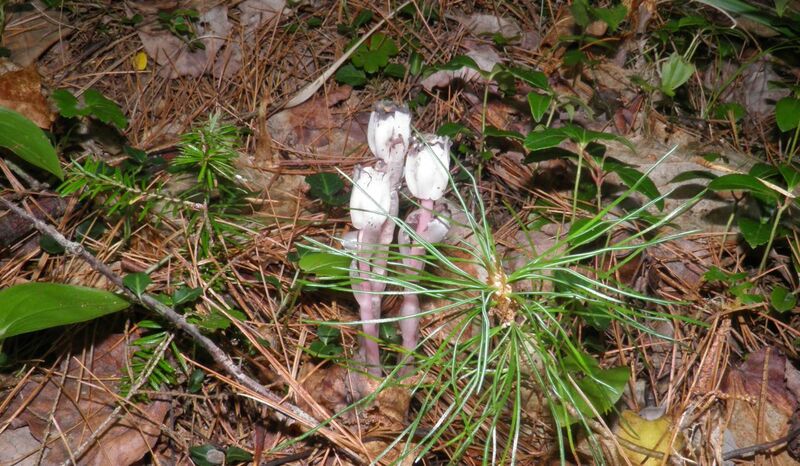 Indian Pipe is usually seen from June to September and is usually found near rotting wood or on very compost-rich forest floors. Its height varies greatly from 2-3 inches to upwards of 10. It is unmistakable because it is very white, the stems have small leaves more accurately called “scales” and the bowl-like flower top crooks over in the shape of a pipe. The colloquial name is quite possibly due to it being used medicinally by Native Americans to treat eye conditions. I have no idea how it was used in that manner. Its rarity is due, in part to the special circumstances it needs to grow. It needs two specific helpers in close proximity. 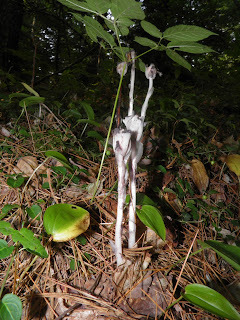 Also because of these circumstances, unlike green plants, Indian Pipe can grow where there is very, very little light, like in dark forest floors. But it is almost impossible to replicate those conditions in a home garden. 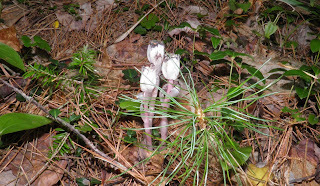 Indian Pipe has to receive nutrients from other sources since it doesn’t photosynthesize sunlight. Its roots tap into the mycelia (root-like threads) of Russula and Lactarius mushrooms. 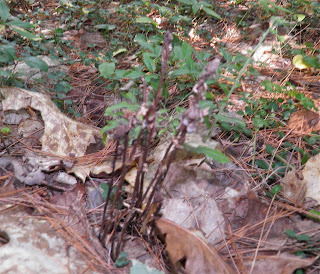 The Indian Pipe takes nutrients directly from those fungus. In turn, those fungi's mycelia tap into tree roots for their energy – because they have no chlorophyll either. Many fungi and trees have this type of relationship. The fungus gives nutrients to the tree and the tree gives nutrients to the fungus. Both organisms help each other out. Indian Pipe doesn’t supply any nutrients to either. It is therefore a parasitic plant. Well, yes, but… It’s mildly toxic when raw, but apparently not so when cooked. References say it tastes like asparagus when cooked. I have heard references that it’s “palatable” but not “choice” (to use mushroom-speak). By that I mean people don’t go out and search it out like cranberries, blueberries or chanterelle mushrooms. There’s not a lot known and all the references seem to link back to one source. At the end of their lifecycle the stems turn black and dry out. That source was from a local scientist’s book written at the turn of the 1900s. The author’s name was W.H. Prest, of Bedford, Nova Scotia. He wrote Edible Plants of Nova Scotia. In it he informs about much of the local flora of Nova Scotia and their degree of edibility. He thought it was abundant. Maybe in 1905, but not so much now, or at least not in my experience. I believe the reference to “death plant” is more to do with its ghostly looks than any overriding toxicity. But, as with all things, caution should be exercised if looking for this to eat.